Shunt Reactor Market is expected to reach USD 4.45 Billion by 2026 from USD 2.78 Billion in 2016 at a CAGR of 4.83% (Detailed analysis of the market CAGR is provided in the report). A shunt reactor is an absorber of reactive power, which increases the energy efficiency of the system. It is commonly used for reactive power compensation in high-voltage long transmission lines and in cable systems. The Shunt Reactor Market has been segmented into type, end-user, application, and geography. The shunt reactor market based on type has been segmented into oil-immersed and air-core shunt reactor. The oil-immersed shunt reactor is expected to form one of the major contributors to the market. Based on end-user, the shunt reactor market has been segmented into electrical utilities and industrial verticals. The electrical utilities segmented formed one of the major contributors for the market growth. Based on application the shunt reactors market has been segmented into the variable reactor and fixed reactor. Geographically, Shunt Reactor Market has been segmented into Asia-Pacific, North America, Europe, Middle-East & Africa, and Latin America. The Asia Pacific is expected to be one of the major market drivers to boost this market growth by 2026. High levels of urbanization, industrialization and infrastructural developments are some of the factors to drive this market growth in these regions. •Shunt Reactor Market analysis and forecast, in terms of value. • Comprehensive study and analysis of market drivers, restraints and opportunities influencing the growth of the Shunt Reactor Market. • Shunt Reactor Market segmentation on the basis of type, source, end-user, and region (country-wise) has been provided. • Shunt Reactor Market strategic analysis with respect to individual growth trends, future prospects along with the contribution of various sub-market stakeholders have been considered under the scope of the study. 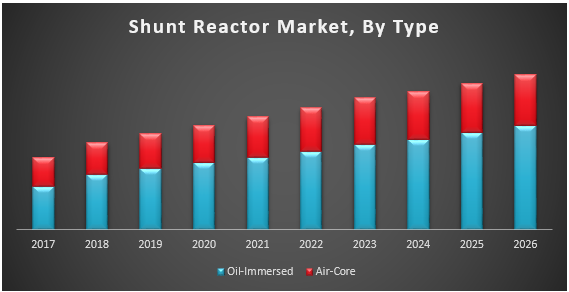 • Shunt Reactor Market analysis and forecast for five major regions namely North America, Europe, Asia Pacific, the Middle East & Africa (MEA) and Latin America along with country-wise segmentation. • Competitive developments, investments, strategic expansion and competitive landscape of the key players operating in the Shunt Reactor Market are also profiled. Bloomberg, Factiva, and Hoovers are some of the sites that are being referred to gain insights about Shunt Reactor Market. Experts from top manufacturing companies along with other stakeholders have been considered. This is done to validate and collect critical information for evaluating trends related to this market during the forecast period. Top-down and bottom-up approaches have been used to estimate the global and regional size of this market. Data triangulation techniques along with other comparative analysis are also used to calculate the exact size of the Shunt Reactor Market globally. The Research report segments the shunt reactor market based on type, end-user, application, and geography. Maximize Market Research offers customization of reports according to the specific requirement of our clients. Global Portable Generator Market – Industry Analysis and Forecast (2018-2024) –By Power rating, Fuel type, Application, End-user and Region. Needle Coke Market – Global Industry Analysis and Forecast (2018-2026) – by Type, by Grade, Application and Geography. Global Power Electronics Market- Industry Analysis and Forecast (2018-2026) – By Material, Device Type, Application, Vertical and Region.